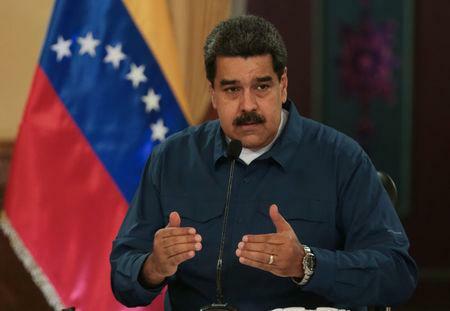 CARACAS (Reuters) - Venezuela's heavily subsidized domestic gasoline prices should rise to international levels to avoid billions of dollars in annual losses due to fuel smuggling, President Nicolas Maduro said in a televised address on Monday. "Gasoline must be sold at an international price to stop smuggling to Colombia and the Caribbean," Maduro said in a televised address. Venezuela, like most oil producing countries, has for decades subsidized fuel as a benefit to consumers. But its fuel prices have remained nearly flat for years despite hyperinflation that the International Monetary Fund has projected would reach 1,000,000 percent this year. That means that for the price of a cup of coffee, a driver can now fill the tank of a small SUV nearly 9,000 times. Recently, the average price of a coffee with milk was 2.2 million bolivars, or about 50 cents, local media has reported. Smugglers do brisk business reselling fuel in neighboring countries. Maduro said the government would still provide "direct subsidies" to citizens holding the "fatherland card," a state-issued identification card that the government uses to provide bonuses and track use of social services. He said the subsidy was only available to those who registered their cars in a vehicle census being conducted by the state.